Fresh from rumors that Nokia would be selling off its handset division to Microsoft, new numbers from Gartner reveal that Nokia’s current market share is at its lowest since 1997. And things could only worsen while preparing to launch devices running on Windows OS. While mobile devices growth has been astounding jumping 19% year on year, Nokia has lost 5.5%, Android took 36% of the pie and Apple doubled its number of iPhone sales. Nobody could had ever imagined that this would happened 4 years ago. Not only that, there are 3 chinese companies occupying the top 10 ie, ZTE, Huawei and HTC (to be more accurate, HTC is a Taiwanese company). Google kicked off its annual I/O conference last night with some headline stats about the growth of its Android platform. 100 million Android devices have now been activated, with another 400,000 being activated every day. There are now 200,000 free and paid apps available in the Android Market store, which has generated more than 4.5 billion downloads so far. Google's Android product management director Hugo Barra revealed the figures in a blog post published shortly after they were announced at I/O. He also revealed that there are now more than 310 individual Android devices available to buy. So what's new with Android? 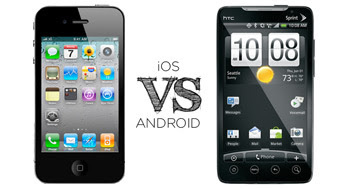 Google talked about the next version of the OS, codenamed Ice Cream Sandwich. "Our goal with Ice Cream Sandwich is to deliver one operating system that works everywhere, regardless of device," writes Barra. That means it will run across Android smartphones and tablets, in the same way that Apple's iOS 4.2 did for iPhone and iPad. Android smartphone owners will get features including holographic UI, better multi-tasking, a new launcher and richer widgets that have so far been restricted to the Android 3.1 Honeycomb OS on tablets. One big criticism of Android in recent months has been the time it takes for OS updates to be rolled out by operators and handset makers. As we reported yesterday, only 4% of Android handsets are running the latest smartphone version of the OS, 2.3 Gingerbread. Google has now taken steps to speed things along though. It has created a 'founding team' of operators and handset makers including Verizon, HTC, Samsung, Sprint, Sony Ericsson, LG, T-Mobile, Vodafone, Motorola and AT&T to banish these update delays. "We're jointly announcing that new devices from participating partners will receive the latest Android platform upgrades for 18 months after the device is first released, as long as the hardware allows," writes Barra. "And that's just the beginning." More news at I/O included the launch of movie rentals in the Android Market, with thousands of films available from $1.99 that are watchable on tablets and smartphones, as well as online. The Motorola Xoom tablet on Verizon will be first to get an update to the Android Market client to enable these films to be watched, with other devices following in the coming weeks. The latest 'BrandZ' study by global brands agency Millward Brown puts Apple at the top, pushing last year's top dog Google to No.2 spot. Behind Apple in the list are Google, IBM, McDonald's, Microsoft, Coca-Cola, AT&T, Marlboro, China Mobile and General Electric. Its hard to comprehend as this was the same company that was almost out of business more than 10 years ago. The full list and report can be downloaded here. 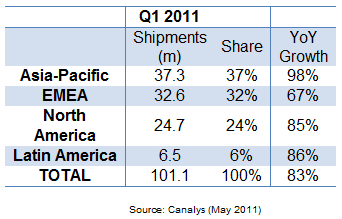 Asia-Pacific has become the world’s largest smartphone region, according to new figures from Canalys. Smartphone shipments in the region reached 37.3 million in the first quarter, a year-on-year growth rate of 98 percent, putting it ahead of EMEA for the first time since Q3 2007. Asia-Pacific growth was driven by countries such as China, South Korea and India, which all recorded triple-digit growth. 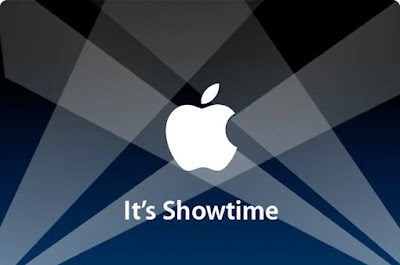 Overall, worldwide smartphone shipments grew 83 percent to 101.0 million units. 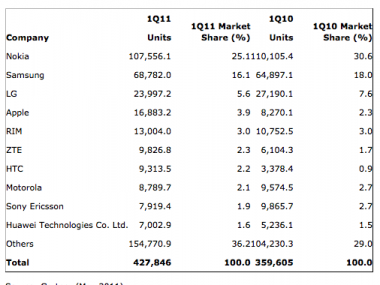 Though its market share shrank from 39 percent a year ago to 24 percent in Q1 2011, Nokia held onto its worldwide leadership position with 24.2 million units shipped – a 13 percent year-on-year rise. Asia-Pacific became the largest region for Nokia, accounting for 53 percent of its overall shipments, overtaking EMEA by more than 3 million units. Canalys’ country-level data shows that the vendor remains number one in 28 countries, including mainland China. At the platform level, Google’s Android OS led the market for the second quarter running with 35.7 million units shipped, increasing its share to 35 percent driven by HTC, Samsung, LG, Motorola and Sony Ericsson, with each vendor shipping well over 3 million devices.